Ultra is a aroma diffuser suitable for large area such as star hotels, shopping mall and automotive exhibition hall. Simple, convenient and flexible mode of operation will bring our customers a smooth experience during using. The scent output is stable and pure, but the noise is only 40dba, which will beyond your imagination. When it works alone, the silent built-in fan will diffuse the aroma to the space continuously. This aroma diffuser is user-friendly, it is convenient to connect to the HVAC because of the wall-mounted design. 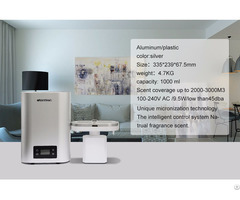 Business Description: CREAROMA Tech (HK) Limited is a technology company which aims to specialize in scent marketing, improving and governing indoor air environment , the two main business : Scent marketing and indoor air environment improvement. Two major brands: Crearoma and Scent-fly, respectively for the comprehensive demands of family residential and commercial environment clients. As a pioneer and innovator in this industry, we have been working on the development of aroma diffuser and plant essential oils. In the spirit of innovation and nature, we try to bring space aroma and the air improvement into a brand-new dimension. Find an optimal balance between the In the customer experience, product performance, art of smell. What we want to do is to make the scent become a way of life, so that the air changes from this moment.